Elizabeth Taylor's role as Cleopatra is an iconic performance in cinematic history. In 1963, Elizabeth Taylor starred alongside Richard Burton in the opulent cinematic masterpiece "Cleopatra." Winning seven Academy Awards, Cleopatra has become an iconic film in Hollywood's history. Transform yourself into Cleopatra, and capture the allure of Elizabeth Taylor's Egyptian queen look of dramatic, winged eyes and gold attire by following simple makeup and attire guidelines and instructions. The focal point of Elizabeth Taylor's Cleopatra look was her dramatic eye makeup. Before attempting to re-create this look, the first step is to make sure you have a few key makeup items on hand. Liquid black eyeliner is a must -- liquid is needed over a pencil eyeliner because of the details of this look. 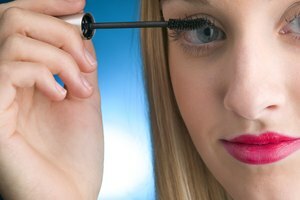 A black eyebrow pencil, white eyeliner pencil, opaque, blue and gold eyeshadows, black mascara and an eyeshadow brush are also necessary. Glitter eyeshadow can also be used, but that is not crucial to the look -- it is more for personal taste. Begin by sweeping opaque eyeshadow over the entire eyelid to the browbone, then repeat this with blue shadow. If you would like to add glitter eyeshadow, apply it now in the crease of the eyelid. Line the inside rim of the lower eyelid with white eyeliner, then fill in your brows with a black pencil. Now comes the most delicate part -- applying the liquid eyeliner. Slowly make a very heavy line of black liner on your upper lid. Draw the iconic Cleopatra wings by going out 2 inches from the corner of your eye for the lower part. Start again in the corner of your eye, and draw the upper line slightly above the first, making a half-inch gap between the two lines. Stop the upper line a bit short of the bottom one, and connect the two with a diagonal line. Fill in the wing with gold eyeshadow. Apply light amounts of gold eyeshadow to the browbone if you desire. Apply generous amounts of black mascara. In the film "Cleopatra," Elizabeth Taylor often wore a black wig with braids that were tied off with gold ribbon. Emulate this style with a gold, Egyptian-style wig, and accessorize the wig with gold-braided ribbon or use a gold chain as a shimmery headband to add some sparkle to your Cleopatra look. A major part of Elizabeth Taylor's portrayal of Cleopatra was her costumes. Famously, she wore a 24-carat gold cape made to look like wings in the film. Re-create this look in your Cleopatra ensemble by pairing your hair and makeup with either a shiny and rich-looking gold dress or gold shirt, and drape a sheer gold scarf over your shoulders. Add depth to your look by wearing large, gold costume jewelry such as bold, dangling, gold earrings or a large gold necklace with jewels. Foy, Blair. "How to Get Elizabeth Taylor's Cleopatra Look." Synonym, https://classroom.synonym.com/elizabeth-taylors-cleopatra-look-13938.html. Accessed 23 April 2019.